Weather: Mostly clear, sunny, cool and breezy. Cold overnight. 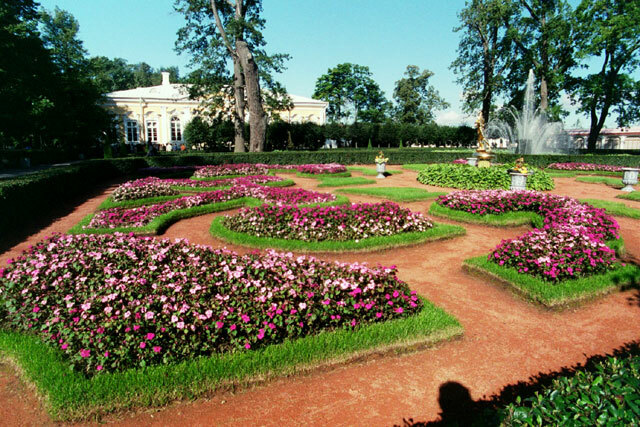 We have set aside today to go and visit Peter the Great's Palace at Peterhof, located west of St. Petersburg on the shores of the Baltic Sea in the Gulf of Finland. And we have picked just the right day - the weather is the best we have had so far during our stay in this city. We had already looked into the different ways of getting there, and opted for the hydrofoil. 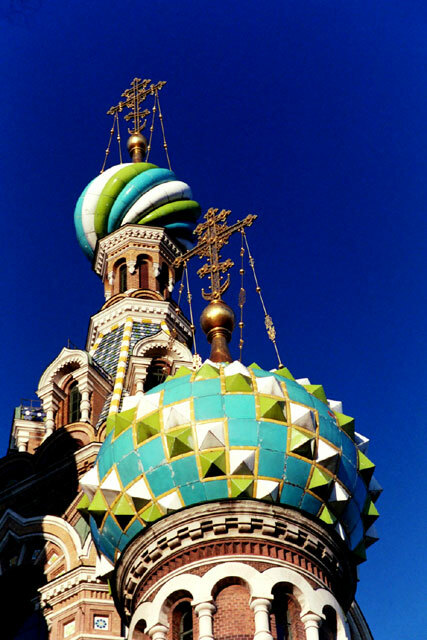 While it is the most expensive way (especially for foreigners, who are charged much more), it is the quickest and will offer us a chance to see St. Petersburg from the water and to see some of the Gulf of Finland. 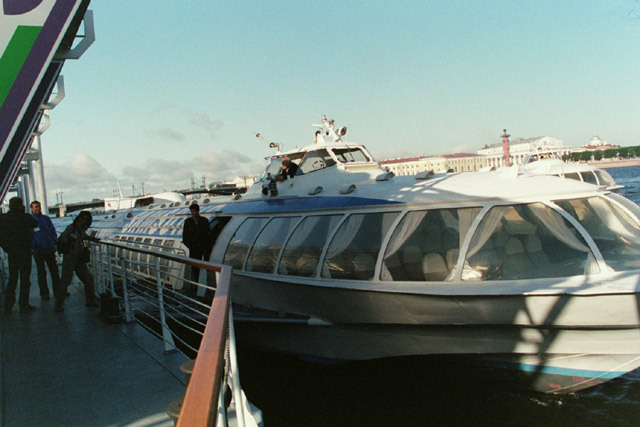 We arrive at the hydrofoil pier situated on the Palace Embankment just in front of the Winter Palace and purchase our over-priced tickets. After taking some pictures, we board the boat for the 30 minute ride to Peterhof. We leave shortly after 10:30 AM and the boat is soon lifting out of the water onto its wings, skimming along at high speed. We even pass underneath a few of the bridges at this speed, with barely inches to spare between the bent radio antenna and the bridge. Soon we have passed through the last of the canals leading to the Gulf of Finland and the Baltic Sea. For the whole time we are out in the Gulf, we can see the golden dome of the St. Isaacs Cathedral glinting in the sunlight. We head further out into the gulf and cruise along for a while before we begin to head into shore. As we make our way to shore, the grand palace of Peter the Great begins to take shape on the slope above the shore. 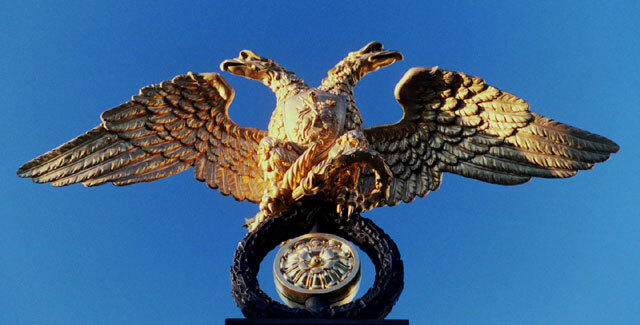 We arrive at the landing at Peterhof just after 11 AM and disembark. At the end of the pier we have to pay our entrance fee to the park itself - we will soon discover that here they charge for just about everything worth seeing. From the landing we enter the Lower Gardens and walk up along the Marine Canal, which enabled the Tsars to sail from the Gulf of Finland right up to the palace itself. 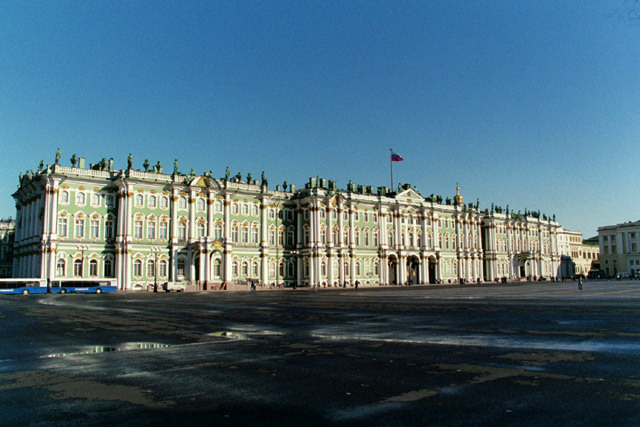 The palace was built between 1714 and 1723 - Peter the Great felt that after his victory over the Swedes at Poltva in 1709 he should build a palace "befitting to the very highest of monarchs". It took over 5,000 laborers, serfs and soldiers to build the place, with the assistance of all sorts of architects, water engineers, landscapers and sculptors. 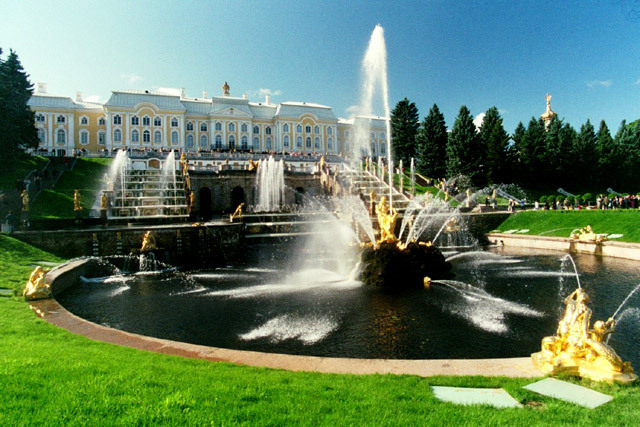 We approach the palace via the Marina Canal and soon we come upon one of the most awesome parts of the palace - the Grand Cascade. 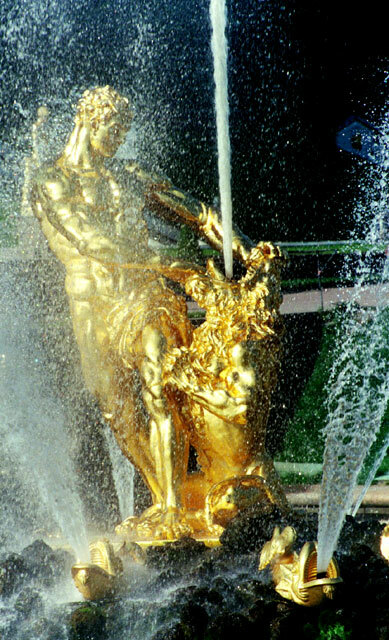 It is a series of stunning gilded statues and fountains and water jets that cascade down from the terraces of the palace to the Marine Canal and on to the sea. With the blue skies and bright sunlight it is a magnificent sight. We spend a few minutes at the base of the series of fountains taking some pictures and enjoying the performance. The center piece is the sculpture of Samson rendering the jaws of a lion. We then go and check out the situation for visiting the palace. The line is huge, so we decide to come back later. So, we go and check out the lower gardens. Some of the best highlights of these gardens are the numerous fountains spread throughout the grounds. 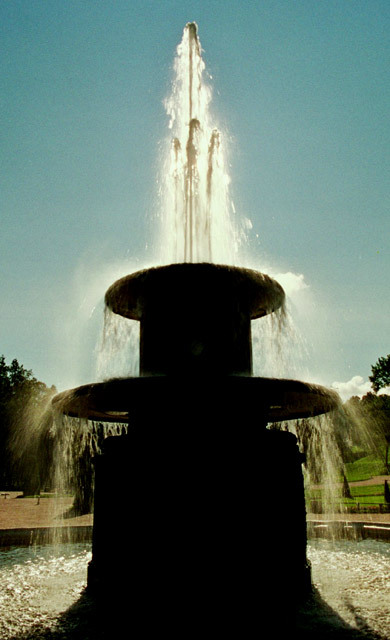 First is the Adam Fountain, which has a companion in the form of the Eve Fountain. Next are the two-tiered Roman Fountains which were inspired by one in St. Peter's Square in Rome. Next was the checkerboard steps and the Dragon Fountain. This was followed by the Pyramid Fountain, with the 500 jets forming an obelisk with seven tiers commemorating the victory over Sweden. There is then a strange rotating fountain that spins around. Finally we come upon a silly umbrella fountain, which rained on those who walked under it. 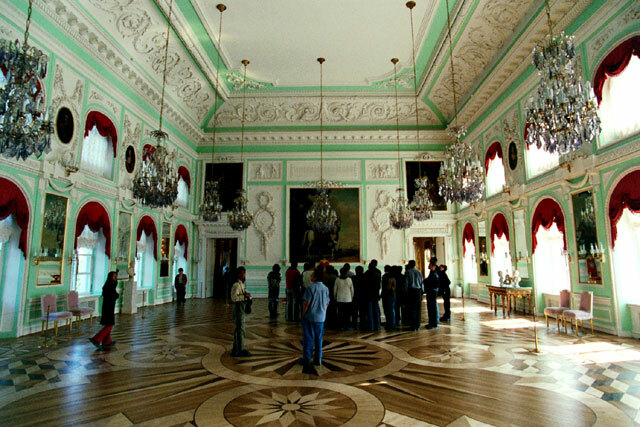 We then come upon the Monplaisir, which was the first palace built here in 1714 which Peter the Great used to live in. We did not go and visit this palace as they charged a separate fee and there was a long line to get in. The palace is right on the shore so we went to view the gulf and then the formal gardens that surrounds the palace. We carry on with our exploration, checking out a fun fountain that sprays those that walk by it. We have to dash through to avoid getting wet. Then it is time for lunch. We stop off at the cafeteria to grab a bite. What a rip off. We get a burger and sandwich. They then charge for every little condiment - 30 cents for a small dab of ketchup and 50 cents for a small pack of sugar and over a dollar for a slice of cheese. They also only fill the beer glass half full - the rest is foam. It takes some persuasion to get her to fill a new one to the top. After our bite we carry on exploring the lower gardens. Next is the Eve Fountain, followed by the Hermitage. 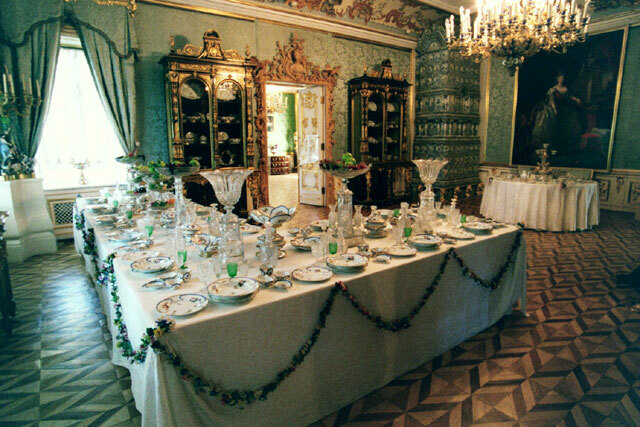 This was a private dining room surrounded by a moat with a small drawbridge. We did not visit the interior as they wanted about $5 to enter the one room museum. After the hermitage we come upon another fountain with no name. Soon we come back to the shore and climb a small rampart. 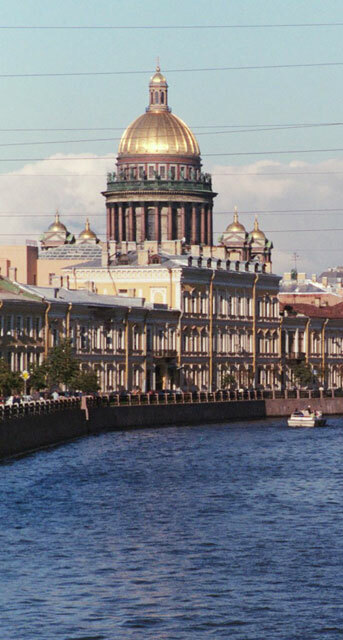 From the top we can just make out the golden dome of St. Isaacs in St. Petersburg. 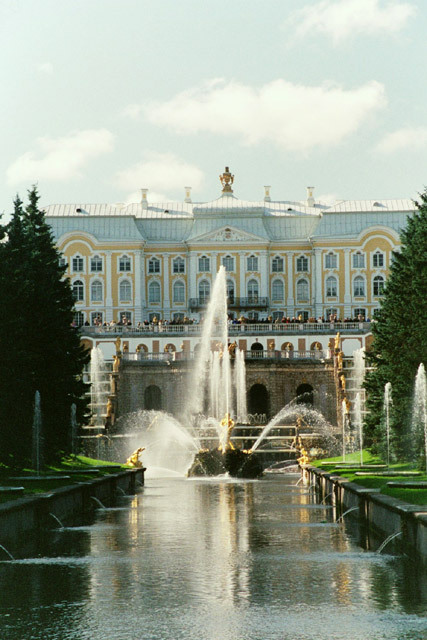 We check out the exterior of the Marly Palace, which was the guest house for the Tsars visitors. Once again they wanted another entrance fee, so we passed. 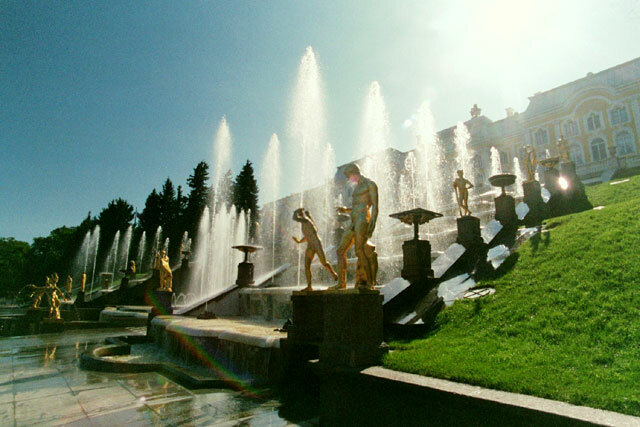 The next fountain is the Golden Hill Cascade, which is under renovation. After passing yet another nameless fountain and once again the Grand Cascade, we return to the Grand Palace at 2 PM. It turns out to be the perfect time to visit. The line has all but disappeared. All the tour groups must be having lunch or something. We pay the $15 each (with photo permission) to enter and begin our tour of the palace. First is the Main Staircase, a stunning entrance with carytids and gilded carvings that just make the staircase glitter. The ceilings are covered with frescoes. We then pass through the State Rooms, with the highlight being the Throne Room. 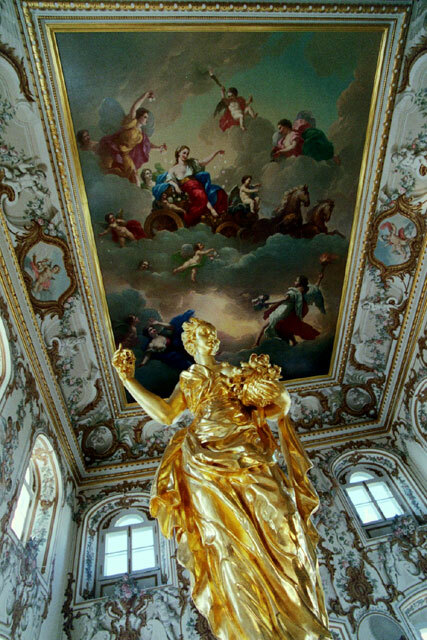 The decoration, actually relatively restrained, is beautiful. We pass through a number of rooms, checking out the excellent restoration work that repaired the total gutting that took place during the Second World War. The ladies that watch your every move were a bit over the top. One even came and grabbed Lars by the arm as he was taking a picture - she wanted to make sure he was not going to use a flash. The last set of rooms that we get to see on the relatively short self-led tour are the Imperial Suites. 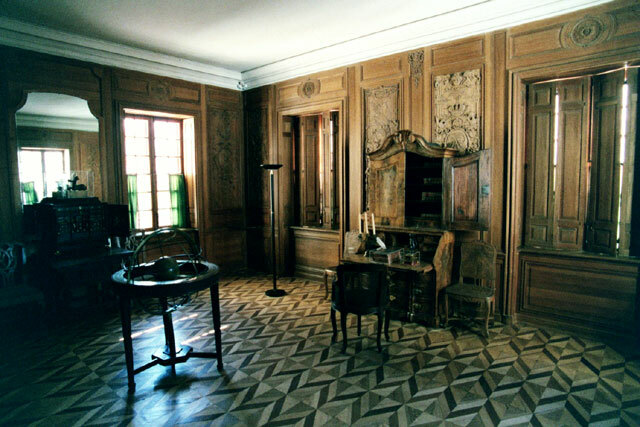 The highlight here is the simple, wood paneled Oak Study of Peter the Great. Some of the oak panels are even the original ones. Then on the way out of the rooms on display, we went through more rooms that had been converted into shops. We were forced to make our way through dozens of small shops that consisted of more rooms than we had just toured. We then spent about 30 minutes touring the Upper Gardens, done in a formal style with ornamental fountains. Along the way we got to the exterior of the royal chapel. Finally it was time to head back down to the lower gardens and walk along the Marine Canal to the hydrofoil pier. We paid our fare and then caught the 3:30 boat back to St. Petersburg. As on the way out, we stood in the middle open deck with the wind blasting past our heads as the hydrofoil skimmed along above the water on its wings. 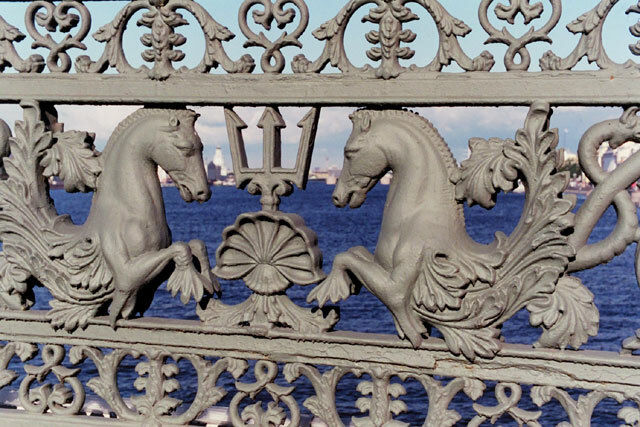 Once back at the Winter Palace pier, we decide to spend the rest of the afternoon continuing our exploration of St. Petersburg on foot. We walk along the Neva embankment to Lieutenant Schmidt Bridge. After going out on the bridge to check out some of the ornamental iron work, we turn south and walk towards the Mariinskiy Theater. Along the way we find a souvenir shop that has a wide selection of stuff at reasonable prices. We pick up a few items before carrying on. On our way to the theater we take a slight detour to the Yusupov Palace, but it is closed. We decide we will return tomorrow. As expected, we find out that the Mariinskiy theater is closed. What to do, so we carry on to the St. Nicholas Cathedral. 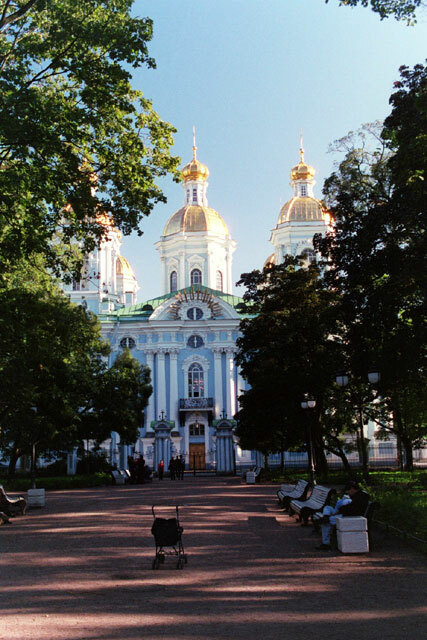 This is a beautiful Baroque cathedral that was founded for sailors. 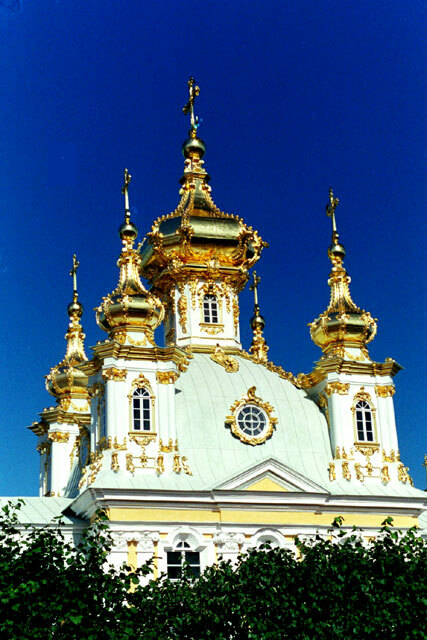 The light blue exterior of the church is broken up by the white columns, topped by five golden cupolas. We then walk all the way to Sennaya Ploshchad along the Griboedova Canal. Along the way we check out the Lion Bridge. At Sennaya we decide to have dinner at a restaurant in the area. After dinner we carry on with our walk along the canal. 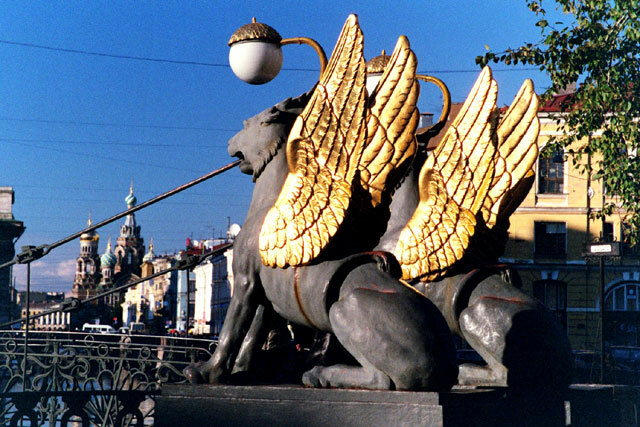 We stop once more at the Bank Bridge, with the golden winged Griffons. 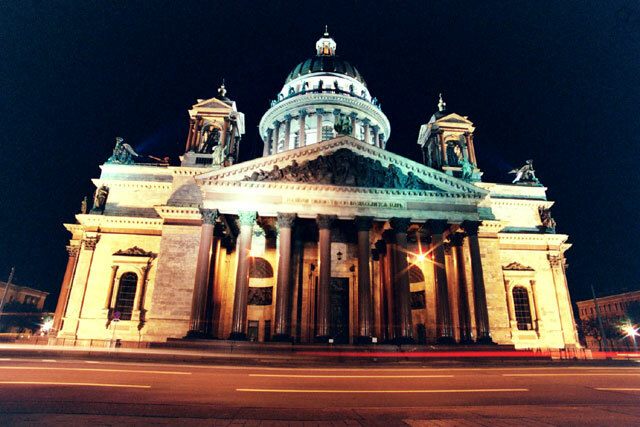 From there we walk past the Kazan Cathedral and make our way to the Church on Spilled Blood. 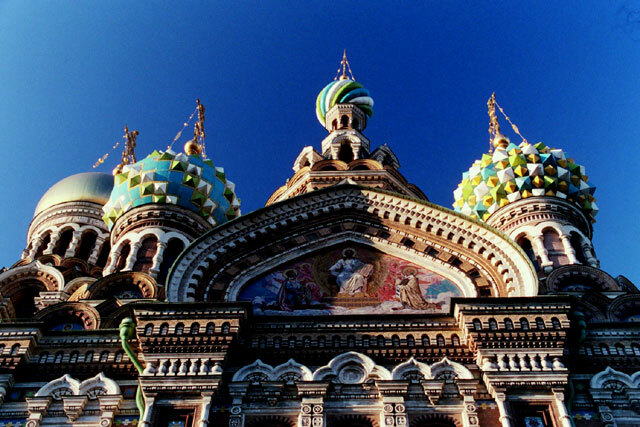 The Church on Spilled Blood is a magnificent sight - all aglow with the warm rays of light from the evening sun. We then make our way over to the Europa Hotel, stopping along the way to check out the exterior of the Russian Museum, which used to be the Mikhaylovskiy Palace. We are visiting the Europa Hotel to meet up with one of our fellow travelers from Kamchatka. She had also traveled across Russia and it turns out we are in St. Petersburg at the same time. There was some confusion about our meeting place and we wait in the lobby for half an hour after the appointed meeting place. Thinking we had missed her, we head out to Nevskiy Prospekt and - run right into her. Luckily we had both decided to give up waiting at the same time!! We headed off to a cafe for a tea and snack and to catch up on what we have each been doing since our Kamchatka trip. We have a good time catching up on the Kamchatka trip and the subsequent adventures. Lots of good laughs. After we finish our tea, we decide to have a drink and carry on our discussion. We are surprised when they make us leave at 11 PM when they close - this is Russia, how can a bar close so early!!! Well, we said good bye to our friend Penny and decided to check out some of the sights at night to take some photos. We walk up to St. Isaacs along one of the canals. We take a few pictures then over to the embankment on the Neva. It actually makes a wonderful nighttime stroll. Many of the buildings along the embankment on both sides are flood lit and there are a few boats that are cruising about and down the river. It is a very romantic stroll along the river back to our home stay.